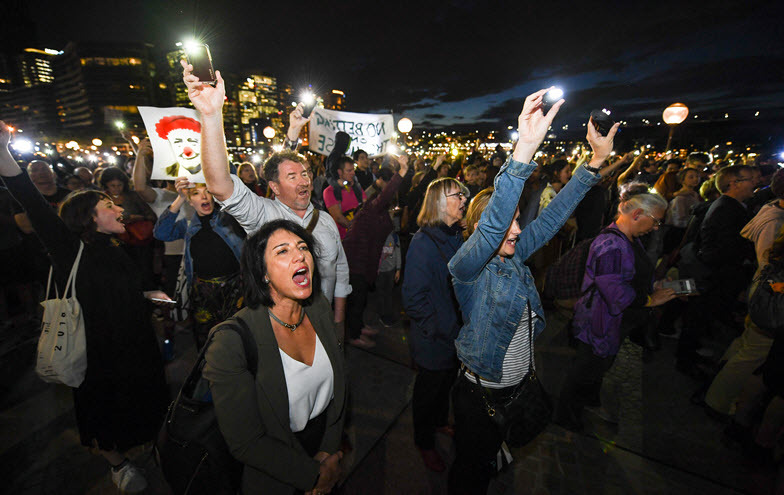 Armed with phones and torches, more than 1000 protesters gathered outside the Sydney Opera House on Tuesday night to protest and disrupt Racing NSW projections on the Sydney landmark. When the lights came on at 7.40pm protesters shone lights from torches, phones and laser pointers over the Opera House sails, in an attempt to sabotage the projection, which displayed the barrier draw for the upcoming Everest horse race. "If there was no place for Jones in Sydney radio, the media would be much poorer for his absence," said one supporter. NSW Labor leader Michael Daley is positioning himself against the powerful Liberal interests who run the SCG Trust. In decades gone by, the roles have been reversed. Are Alan Jones and Co responsible for science denialism? Or are Jones and his ilk more likely to influence politicians, rather than change minds within the general population? Is the Alan Jones era of radio over? Alan Jones' audience is large, but it may not be the audience that Nine wants in its new radio network. Australia has so far avoided the fate of the US, where economic and political conditions have enabled a slide into fascism, but we still have the potential to follow America if our political class doesn't lift its game.